Despite the fact that this series has become one of my favorite series of all time (literally, it’s now tied with two other series for my #1 favorite spot), I was extremely apprehensive about picking up this installment! Not only is it so close to the end (just one book left! ), but it takes place from Chaol’s perspective in the Southern Continent, and if you’ve read my reviews of the other books in this series, you know I’m not his biggest fan. With that in mind, I’m not sure why I ever doubted Maas’ ability to entertain me, because no amount of dislike for Chaol could have kept me from still enjoying this book quite a bit. While Chaol is incredibly angsty and self-loathing through most of the book, and that aspect of his personality gets old quickly, he also grows so much as a character and comes to recognize his own flaws and mistakes in a way that makes it hard not to forgive him. He’s still not winning Character of the Year awards from me any time soon, but I definitely don’t hate him. There’s also a lot to be said for his disability rep. Chaol begins the book hating his wheelchair and himself, but he grows to accept his new disability and begins to realize that it’s going to hold him back from so much less than he thought it would. There are also a few discussions regarding how disabled individuals can feel like guinea pigs for physicians (healers), or how painful it is to be treated differently. I won’t promise this rep will work for every own-voice reader, but as someone who suffers from chronic pain and invisible disabilities, there were moments that actually made me cry because I felt so strongly understood by Chaol’s representation. It was like waking up or being born or falling out of the sky. It was an answer and a song, and she could not think or feel fast enough. The real shining stars in this book, though, are Nesryn and Yrene. They are both such enjoyable characters, and I especially loved watching the way Nesryn came to life when she finally got to come home. There’s a lot of talk about her feeling out of place at first, but she quickly comes to realize that she’s been welcomed into her homeland with open arms by almost everyone she meets, and it means so much to her that it’s incredibly heart-warming. They’re both strong-willed, independent women who could take on just about anything, whether it’s through Nesryn’s archery or Yrene’s healing, and I cherished them both tremendously. We also meet quite a few new characters in this installment, as well as seeing some old faces (this would be a good time to tell you that it’s practically a requirement to read the Assassin’s Blade novellas before picking up Tower of Dawn!). I’ve mentioned this before, but I am a sucker for storylines that rally together all of the older, minor characters in the end, and Maas does that beautifully in both Empire of Storms and in this book. I especially loved watching certain puzzle pieces fall into place for characters (as in the scene with Chaol and Yrene at the end of the book that literally made me weep over how much I love Aelin). Some swore the cats had been caught pawing through the pages of open books—reading. One thing I want to address, though, that made this a 4.5 instead of a solid 5 for me, is the fact that it was originally intended to be a novella, and then was almost 700 pages in the end. On the one hand, I do think this book is longer than it should be—but on the other hand, a novella length wouldn’t have fit everything in, either! I think something in the 450-500 page range would have been a much better length, but it’s not a big complaint from me, as I’d always rather a book be a little too long than way too short and rushed. This was not the end. This crack in him, this bottom, was not the end. He had one promise left. And finally, because a lot of people have asked me in the few days since I finished reading this: is this book required reading for the series? YES. 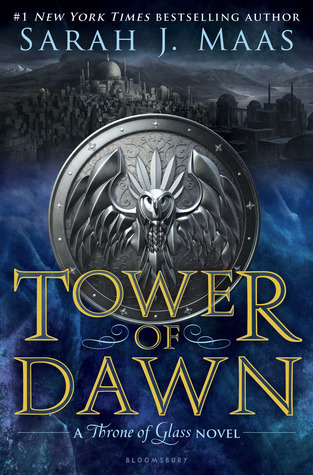 There are reveals in Tower of Dawn that are freaking HUGE for the series as a whole, plus there is so much character development that I honestly think you can’t afford to miss it. If you’re one of the series fans who simply refuses to read this, please, at least get a full-spoiler recap from someone! There’s just too much to miss. State of the ARC #4: October! Too funny! I find that a lot of people I’ve spoken to about the series seem to like either Aelin or Chaol, and since you mentioned the other day that you’re no fan of Aelin, it doesn’t surprise me that you like him! It could be that I’m just looking at anecdotal evidence from talking to people, but I feel like the series is written in such a way that almost forces the reader to take sides between them, even though they aren’t necessarily “enemies”—if any of this makes sense at all! Agreed! I think it would’ve been more enjoyable that way, but I get that Sarah loves Chaol’s character and wanted to dote on him a bit. Still, I wish it’d been shorter. 😛 You’re right, though, the development was really nice and it was sweet to see him find happiness. Yes, yes, yes! Your review encompasses just how I felt! I was apprehensive as it was just Chaols story but I fell in love with this story! I’ve just started Kingdom of Ash and that sucker is MASSIVE!!! Thank you! 🙂 Oooh, yeah, KoA is huuuuge! I’m finally starting it today, I think. I’ve been putting it off since Tuesday because I’m scared lol! I’m 50% in and I am so hooked! Lol, I feel you! Some of the books I swear I won’t read end up being ones I love! I just started reading Queen of Shadows and I am super excited to read this one. I love the inside of the dust jacket. It is absolutely stunning! Thank you for the warning on having to read Assassin’s Blade before this one, better to have learned that now then later. I also didn’t know about Chaol becoming wheel chair bound in the series, so my heart did just break a little bit. Amazing review! Enjoy QoS! It’s so good — probably my favorite in the series. I hope you have fun with these next few books! And I’m so sorry for the spoiler, I always forget that sometimes people will read reviews for books later in a series if they haven’t gotten to those books yet! I think I also got spoiled for him getting into a wheelchair so long ago that it honestly slipped my mind that people don’t know. 😭 I’m so sorry!